A solved puzzle! Oh happy day! Dr. Eureka is looking for a new assistant, and it could be you! Granted, he’s a little eccentric, but he is a genius–the world’s foremost authority on molecules. But can you keep up with him in the lab? Dr. Eureka set up. The top card of that deck is just itching to be flipped. 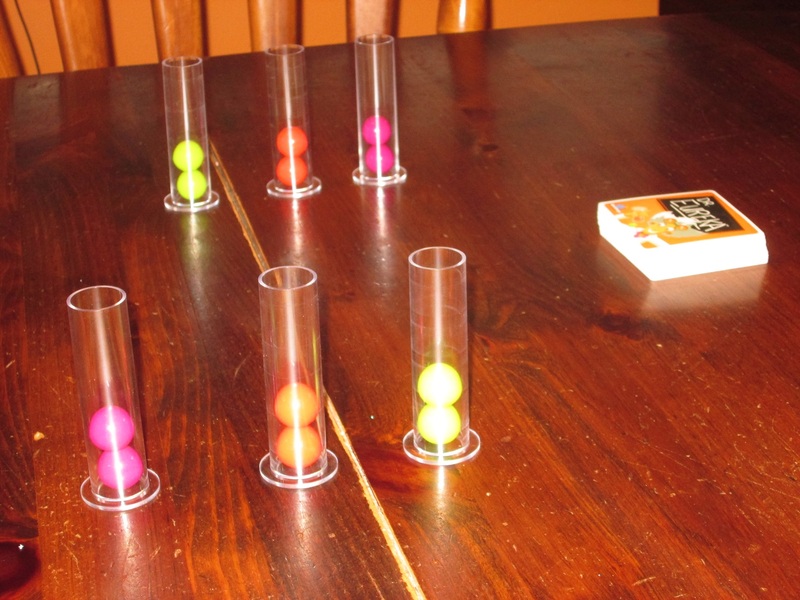 Each player receives three test tubes with two marbles of each color in each. 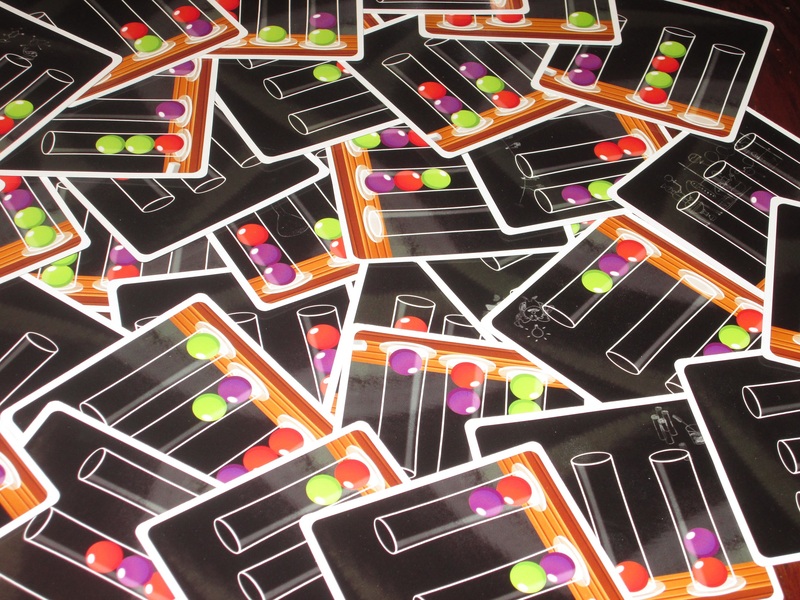 One player flips over the top card of the deck, and players pour the contents from one test tube into another to get their lineup of three test tubes to match the picture on the card. Players may not touch the marbles or drop the marbles on the table or they are out. 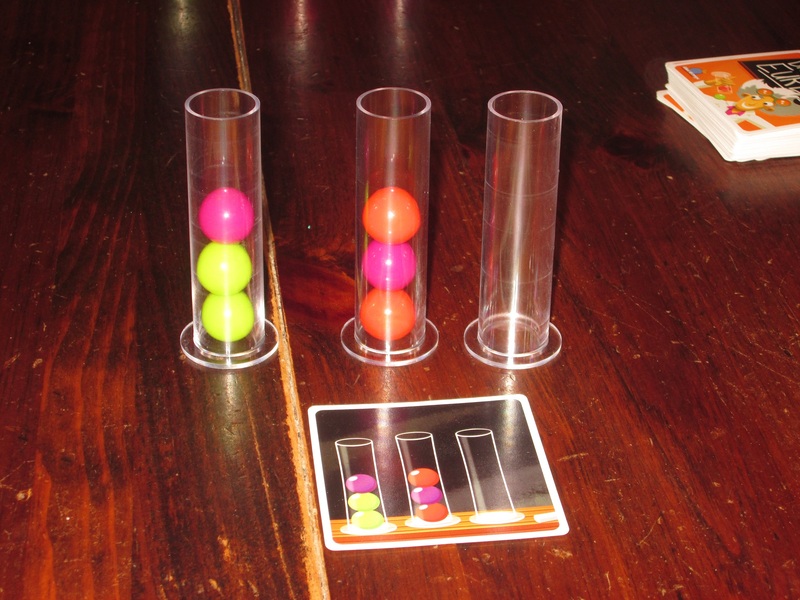 When one player shouts, “Eureka!” play stops, and the players check that player’s work to make sure the test tubes match what’s on the card (in contents and order). If they do, the player who shouted “Eureka” keeps the card and a new card is flipped over. (The contents of the test tubes remain as they are for the next challenge.) If the player who stopped play does not have the correct lineup of test tubes, that player is out and play continues. Once one player has five cards, that player wins. 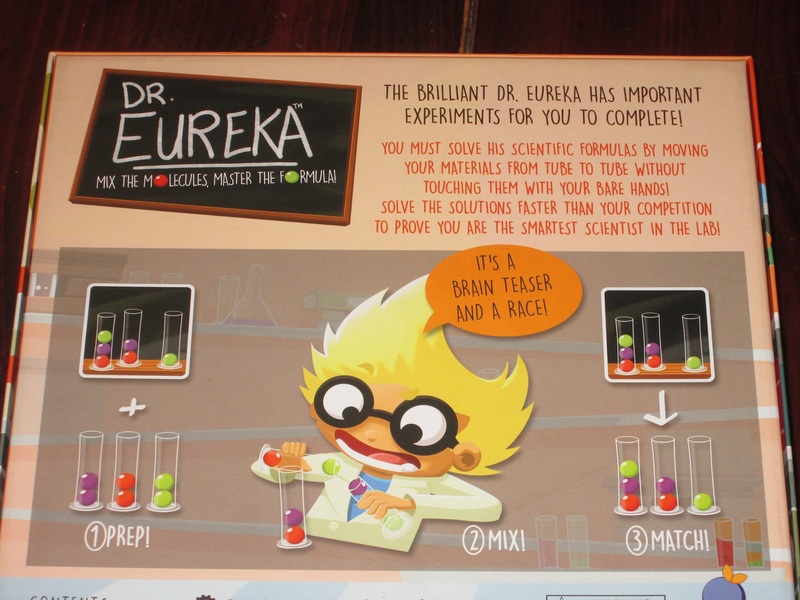 Dr. Eureka is a simultaneous puzzle-solving game that relies heavily on dexterity. If this sounds wild and wacky to you, that’s because it is. And whether your group can handle wacky will likely determine how you feel about it. “Simultaneous puzzle-solving game that relies heavily on dexterity” describes the kind of game that gets me excited, as if it were tailor made for me. I love puzzles, speed games don’t bother me, and dexterity games are among my favorites to bust out with friends and family. So it’s almost a given that Dr. Eureka is for me. But is it for you? Components-wise, Dr. Eureka is flawless. The included test tubes, while having the appearance of glass, are sturdy and fun to handle. (They’re actually a thick plastic.) And boy, do they need to be sturdy since they will be handled quite a bit and slammed on the table right side up or upside down. The marbles are just small enough to fit through the test tube openings but not small enough to make pouring them from test tube to test tube an easy endeavor. The game requires coordination and presence of mind, and the components confirm this at every pass. When I checked the MSRP after playing, I was stunned that a game that looks and feels this good could have an undiscounted price just north of $20. So know that you’re getting your money’s worth here. You’re also getting your money’s worth in terms of spectating. Dr. Eureka is a fun game to watch, even if you’re not playing. Since only four players can play at a time with one copy of the game, I’ve often found myself acting as a game master, and I have to say, as much as I enjoy playing the game, observing others might be even better. You get to see players frantically puzzle out what they need to do, then struggle against their hamfists and sausage fingers as their bodies refuse to implement the plan they’ve concocted. 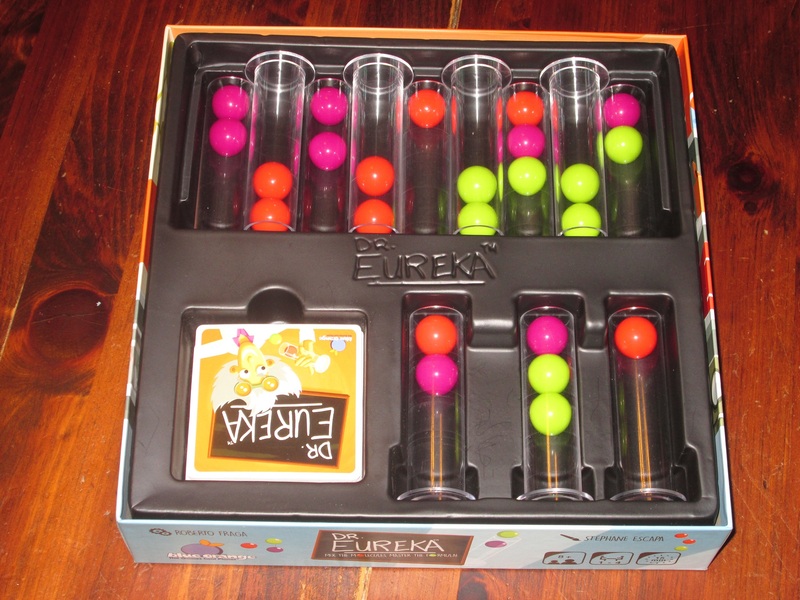 You get to savor every detail of the smug “Eureka!” turned sullen disappointment once a player realizes he or she stopped the round before moving that last test tube into position. And when you watch the game, you’re off the hook for performing. The puzzle cards in Dr. Eureka. The game comes with a fat stack of these, and solving one puzzle to the next isn’t something you’ll remember, so these cards should provide ample replayability for the game. Dr. Eureka, perhaps more than any other wacky dexterigy game I’ve played, has a bite to it. The reason is that the task players have to perform is a mind one: you have to determine an efficient way to manipulate the contents of your three test tubes to match the card and then execute your plan. This involves a surprising amount of critical thinking. Yes, there are some zany twists and turns thrown in, but Dr. Eureka, before it is a wacky dexterity game, is a mind game. And it’s this aspect that has determined its success or failure in the groups I’ve played it with. For some, the mind puzzle isn’t a bother: Dr. Eureka is just another dexterity game, and they can approach it in that vein, even if they don’t win. For others, always being a fraction slower at figuring the puzzle out is frustrating–to always feel like you’re on the cusp of success but to have it stolen from you right before achieving glory. Because this is a mind puzzle, it’s easier to take failure personally than in stacking games. Instead of, say, Rhino Hero, where the tower just got too tall and your sausage fingers got in the way, in Dr. Eureka it’s easier to blame your noggin for keeping you from success. Again, this isn’t the case with every player, but I’ve noticed in my groups that some players get frustrated and discouraged when playing, which unfortunately saps some of the energy from the game. 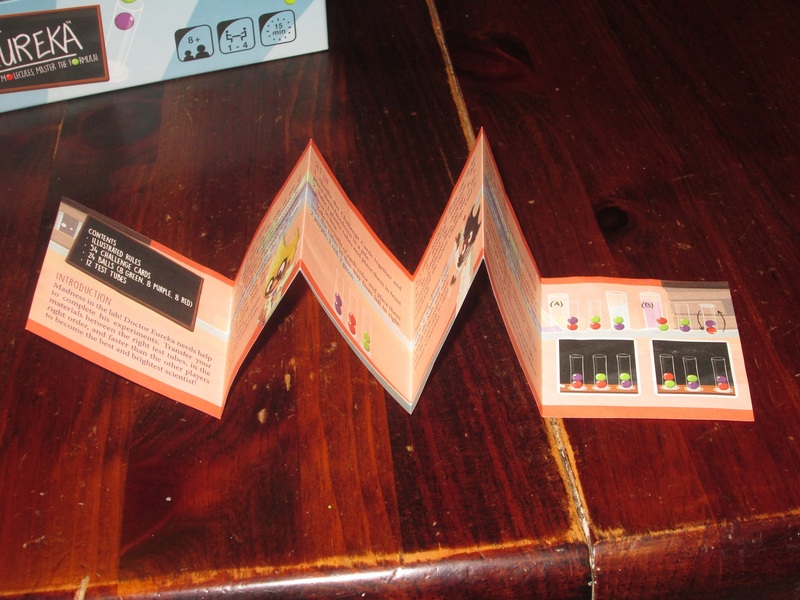 The insert for Dr. Eureka is great. All the test tubes and marbles are held in place (although the marbles jiggle when carried in a backpack, causing puzzled stares from passersby). 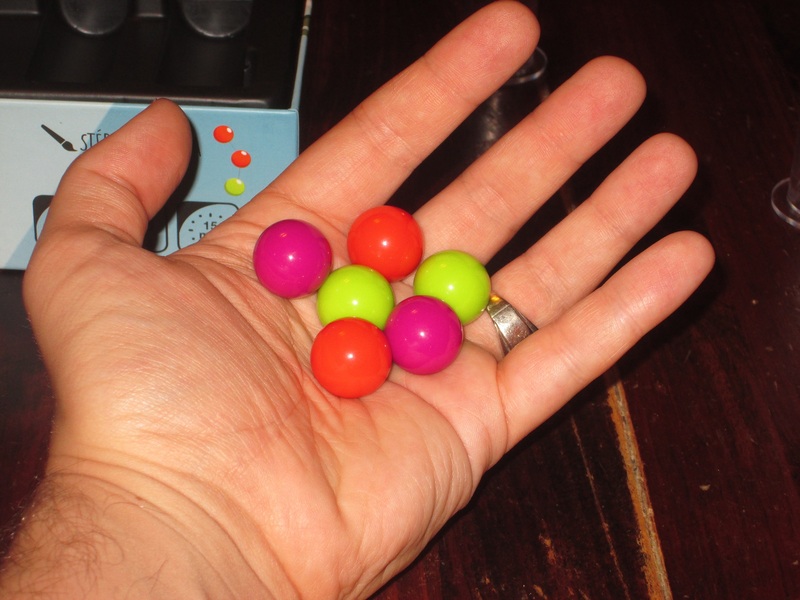 I’ve played Dr. Eureka many times but only at the four-player count (and once at the eight-player count–we played in teams of two, and it worked well in this environment as a party game), so I don’t know how it is with fewer players. The thing about Dr. Eureka is that I don’t envision ever playing it with one or two players, simply because it’s the kind of game that’s so easy to explain and play and so fun to watch that it’s easy to draw a crowd to the table. And the game plays great with the energy of a crowd. In fact, I’ve heard of others buying multiple copies of Dr. Eureka, and since the gameplay is simultaneous, everyone can play at once. I imagine this might provide a logistical hurdle–everyone needs to see the card they have to match–but there’s no reason this couldn’t work. 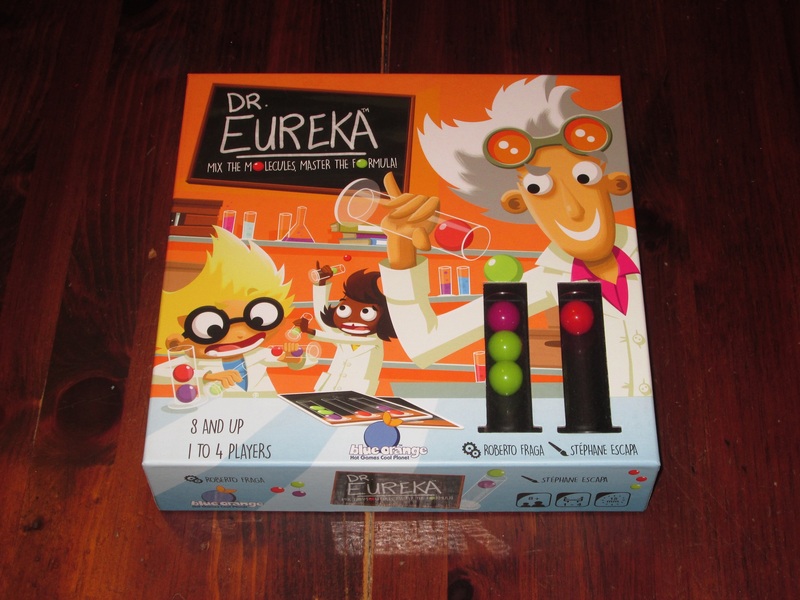 I think Dr. Eureka is a great game and perfectly packaged, and it seems like the kind of game that would be a great logic puzzle for older kids and adults. I love it, but be advised that this game is more polarizing than some other wacky dexterity favorites, and because the puzzles you’re solving involve a good deal of logic, it can bum out players that aren’t as quick at making the necessary calculations. But if you have the right group–and many groups will be the right group–the fun contained in the box isn’t just a hypothesis; it’s a foregone conclusion. iSlaytheDragon would like to thank Blue Orange Games for providing us with a copy of Dr. Eureka for review.